﻿It’s that time of the year again. Yep, time for Tecno Mobile to update their flagship lineup with a new device, and guess what? Skipping the number seven (7) and moving all the way from a 6ix to an 8ight, Tecno’s flagship device for 2017 is [drumroll?] 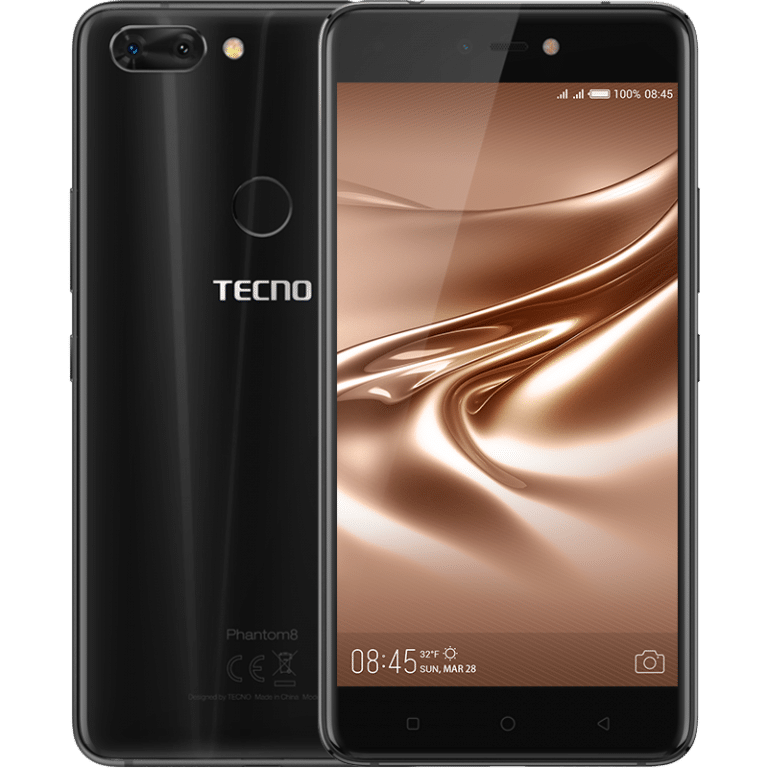 the Tecno Phantom 8. Unveiled in the Middle East (Dubai, specifically), the Tecno Phantom 8 is a dual hybrid SIM Android device shipping with the Nougat flavor of the operating system (version 7.0) sandwiched with Tecno’s proprietary user interface: HiOS. Its display is nothing new; a 5.7 inch IPS LCD touch display having a 1080p resolution and a pixel density of about 386 pixels per inch and for protection, a 2.5 glass is present on top of the display. Beneath the “Diamond Fire” hogwash exterior sits a MediaTek Helio P25 SoC which is an Octa-core CPU having a clock speed of 2.6 GHz for the Phantom 8 supported by the Mali T720MP4 GPU for processing graphics. That and an enormous 6 gigabytes of RAM for a fluid multitasking experience plus about 64GB of onboard storage for files and media. If for some weird reasons, 64GB would be too small a storage unit for you, you can pop in a memory card (theoretical capacities up to 2TB) into the device. Bear in mind, however, that the card would take up one of your SIM slots. We’ll start with the selfie shooter. The front-facing camera of the Tecno Phantom 8 is a 20-megapixel lens having an f/2.0 aperture supported by a dual-tone dual LED flash beside it for low light lighting. The rear-facing shooter, on the other hand, comprises a dual camera setup. One of the lenses is a 12-megapixel wide angle lens while the other is a 13-megapixel Telephoto lens. The implementation here would be similar to how most other high-end smartphone manufacturers do theirs; the 12MP lens for ‘normal’ still shots and the 12 + 13MP lens for better bokeh effect — something Tecno PR is touting with yet another fancy name: “Auto Refocus”. There’s no word out (yet) on whether or not the wide angle or telephoto lens (primary the wide angle though) is optically stabilized, at least in the numerous places I’ve checked, but here’s to hoping it is. Still no 4k video on the Phantom this year though. What you’re getting is a dual camera set up that can shoot 1080p videos at 30 frames per second, at best. For security, the Tecno Phantom 8 relies on a fingerprint sensor which is situated in the right spot at the back of the device (*coughs* Samsung *coughs*) which can be used for quickly unlocking the device and a few other things. To stay alive, a Lithium Polymer 3500 mAh battery which can be juiced up really fast is present. What can I do if my speaker is affected by water? This device is quite nice…. Beautiful. Time would tell, wouldn’t it? Don’t hold your breath though. Transsion na Transsion.